It is a common trait that those who organise events for a living do so as a result of their own love of attending events. I am not any different. For me the joy is scouring social media, blogs and other sources of news and finding the new or stand out events. I have no idea how I came to know about La Resistance (http://www.laresistance.cc) but I did so initially too late to take part in the first edition, post event reporting mean’t I wasn’t going to miss out again. Luckily ahead of the event I got to be part of a recce of the longer Tour de La Resistance course, a 3 day bikepacking version, so I was well prepared when the real event rolled around. First of all, lets outline where La Resistance sits in the ever broadening spectrum of ‘Gravel’. 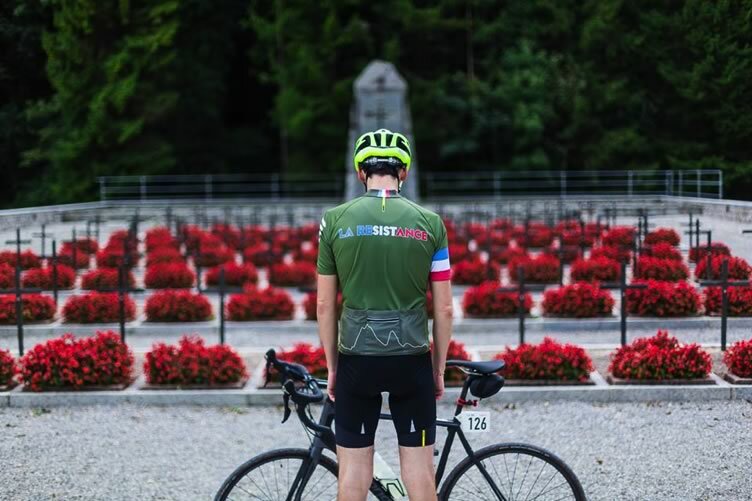 We all know gravel racing and riding originates from the mid-west of the US where there is a huge network of gravel roads that host the oldest and largest events in the world. When gravel migrated to Europe and on the whole these gravel roads were not in abundance a new outlook had to be formed on what ‘gravel’ meant. 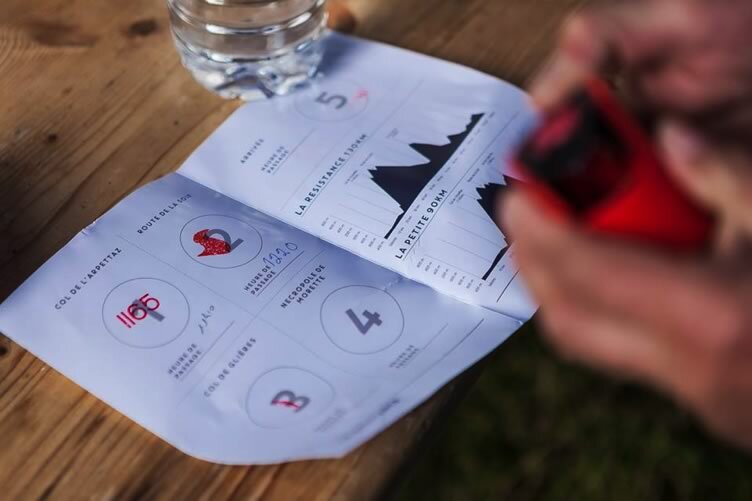 The La Resistance course offers what I think is the best version of alternate gravel, a course that on the whole is not suited to either road bike or mountain bike. 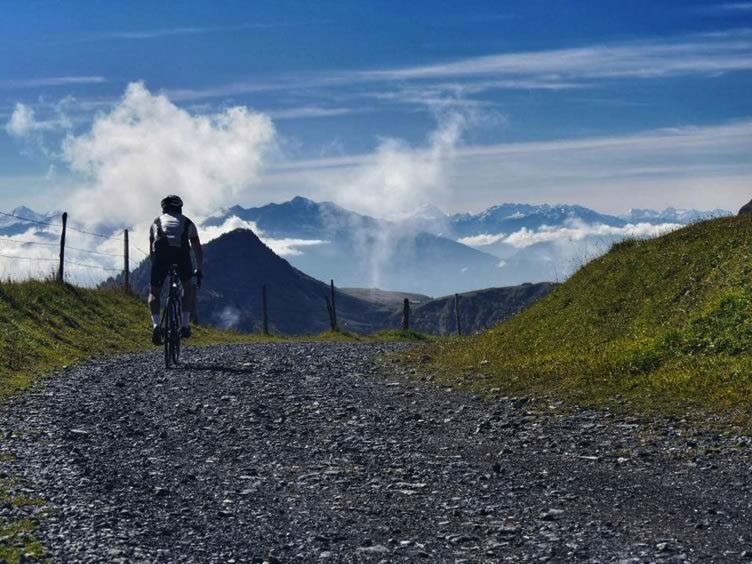 There are sufficient sections of road that a mountain bike will be slower but conversely these road sections are matched with sections of gravel track so a road bike can never rule the day entirely. So we know where La Resistance sits in the spectrum of gravel, but where geographically. 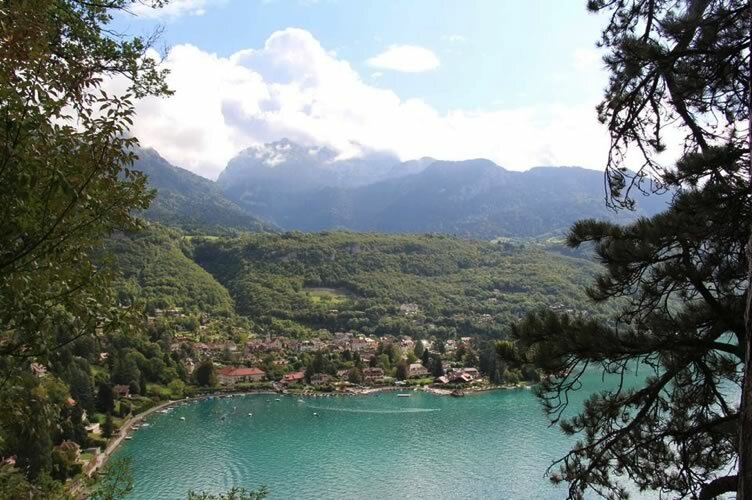 Talloires, the home of Basecamp (the business founding the event), sits beautifully on Lake Annecy surrounded by elevated peaks and a host of riding potential. The event itself starts on the shores of the lake, heading out south before making a turn to start the first col, Col De L’Arpettaz. With a mixed field of on and off-road riders there is an optional gravel/off road section at the start before the Col, naturally on a gravel bike this had to be ridden. 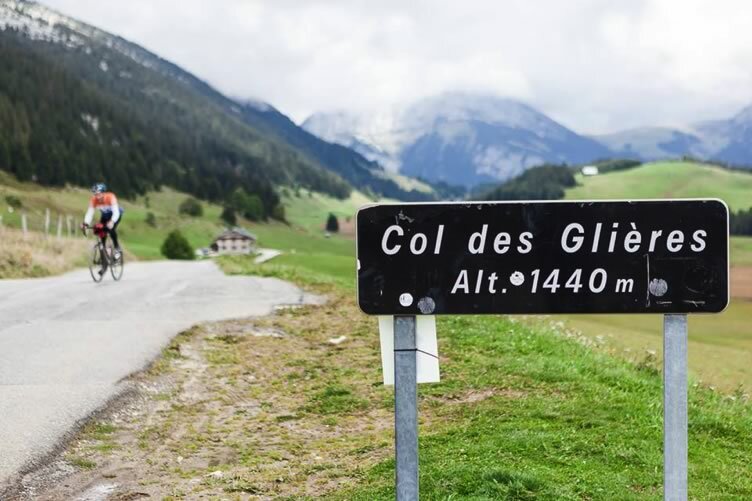 The Col itself presents a sustained road climb of close to 15km gaining 1165m of height as you climb to the first check point and feed station just short of 40km in to the course. So far, the course had switched in equal measure between on and off road so the next section was again to be off road, Route de la Soif. 14km of undulating mountain gravel road slowing down the narrower of tyre and allowing the gravel and mountain bikes to stretch their legs again. The gravel section fires riders out at checkpoint 2 and the one of the highest parts of the course a top the Col de Aravis. From here you need to add a layer or 2 as the descent in to the valley is near 10km long. Just as you feel like the descending is never going to end, it does and abruptly. We reach the climb that stands out in infamy amongst all reports of the previous year’s event. Col des Glieres, this climb is a mere 6.8km long achieving a height gain of 660m but the average 10% gradient is the killer. 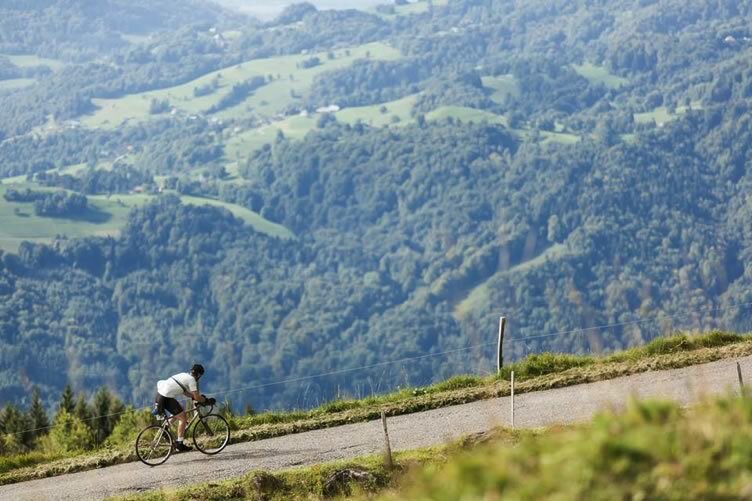 The tarmac climb winds its way up the hillside with some of the more severe pitches of gradient being delivered on the longest straight section of the climb.. As the tarmac ends at the refuge near the top the gravel takes overs to take riders up the final pitch. From the top you look across the meadow which is where you find the Monument de La Resistance, the reason for you being here as it is the inspiration behind the event. Erected as a tribute to the French resistance fighters of the second world war and home of another check point and feed. Another long descent shaves off the previous climbs elevation gain and the riding is now more undulating with fewer sustained climbs and descents. The last feed and a checkpoint is located at La Necropole de Morette, another significant monument to the war effort in this region. From this point the end is close and soon you are descending toward the lake. A final check point at Basecamp Café and a roll to the lake shore and finishing line, 130km ridden and 2800m of climbing achieved. La Resistance posed the perfect challenge of mixed surface riding amongst beautiful landscapes whilst absorbing the history of the region. It’s a stand out event we feel should be on everyone’s must ride list … roll on 2018 edition. Grinduro 2018 Announced Focal Events head to Iceland, trip report from Andy and Bryan.